Architects Simone Carneiro and Alexandre Skaff transformed a cramped São Paulo apartment into a mid-city refuge for Simone Santos. Carneiro and Skaff demolished a wall that had enclosed the old kitchen to open up the 2,045-square-foot apartment. Another view of the apartment before it was renovated. A Muuto Stacked shelf system hugs the wall beneath the window in the dining room. 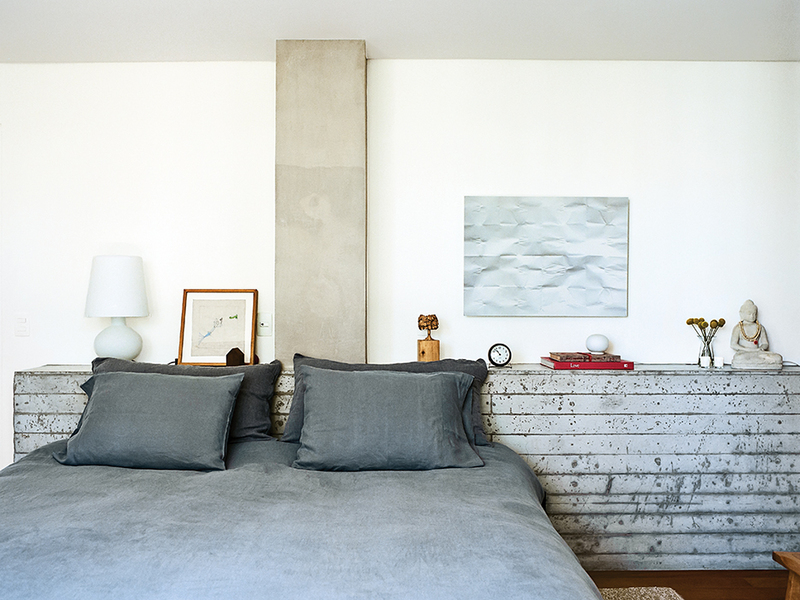 SAO Arquitetura designed the bed and the board-formed concrete headboard in Santos’s master bedroom. 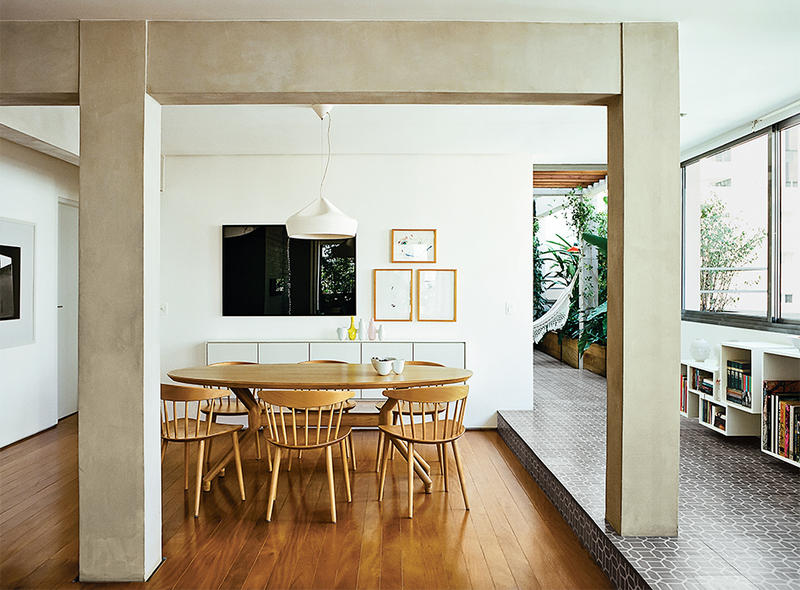 A cement-tile floor carves a path through the dining room as it runs the length of the apartment, blurring the boundary between inside and out. A shot of the terrace before renovation. At rush hour, São Paulo, Brazil, convulses with traffic of biblical proportions. After a late dinner, the city embarks on what is arguably the world’s most electrifying nightlife. And when it finally succumbs to sleep, the ever-present threat of crime forces residents to keep one eye open. This relentless pace makes Brazil’s cultural and commercial capital thrilling but also exhausting. The city forgot to build in buffer zones—grounds to absorb all that excess charge. Neglected sidewalks discourage pedestrians. Green spaces are achingly rare. 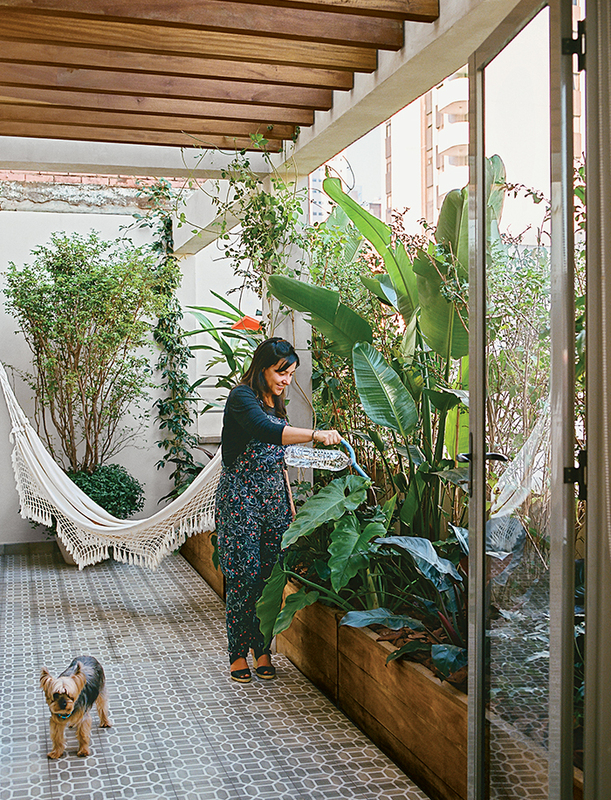 By her mid-30s, Simone Santos, a single financial manager, was feeling São Paulo’s toll. Weekends in the country provided a brief reprieve but required long confrontations with yet more crushing traffic. So she decided to build a garden in the middle of town. But Santos wondered whether she could find an apartment within her budget that also had that rarest of amenities: a quiet terrace. Fortunately, she was not in a hurry—her search took five years. It also helped that, in a city that prizes the glittering and new, she was willing to live in a modest older building. When she finally saw a corner apartment with structural problems and a warren of light-starved rooms, she could see the possibilities. The architects incorporated a cramped bedroom into an enlarged living-dining space. They swapped dark-framed windows for larger panes set in aluminum frames, and they integrated the kitchen into the brighter, airier flow of the reimagined space. After much discussion, they decided to preserve the serenity of the narrow living area with a raw-concrete partition wall. Yet they created a seamless connection by bringing the wood flooring into the kitchen and extending the elegantly monolithic kitchen cabinets into the living area. For Santos’s serenely monochromatic bedroom, the architects took a similar approach. Two small bedrooms became one, and a narrow window became a wide glass door. Light filters through green vines. Birdsong beats out traffic sounds. To keep to Santos’s $218,000 budget, Carneiro and Skaff restricted themselves to a narrow palette of inexpensive materials. The floors are perobinha, a low-cost local wood whose warm tones are balanced by cool, raw elements like the concrete partitions and the humble cement tiles on the terrace. “Local craftsmen know these materials intimately, so we could also achieve excellent results without high-cost specialists,” Skaff says. The repetition of materials also helped reduce waste, as did reusing demolition debris to build up parts of the terrace garden. Despite the modest nature of the materials, Carneiro and Skaff took great care in their deployment. In fact, the architects’ precision and attention endowed the apartment with a meditative quality that contributes to its greatest luxury: serenity. There are several board-formed concrete walls whose uncannily light, ash-gray tones help to brighten the space. The cement tiles, which move inside from the terrace to the dining area, are arranged in a mathematically rigorous geometric pattern. And all the materials meet with invisible finesse; for example, a tiny, caulk-filled dip in the perobinha floors separates them from the walls, giving the concrete masses the appearance of floating. Most walls are white; along with the clean lines of the interior, they provide a tabula rasa for the apartment’s raison d’être: the narrow but elegant terrace. Enlarged windows and strategic plantings seem to bring the garden inside. “We also linked the inside and outside with the tile work,” Carneiro says. In fact, a section of the terrace has been glassed in and incorporated into the dining area, making it hard to say exactly where the apartment ends and the garden begins. But the garden is more than just decorative; it does its share of work as well. It bears fruit, like the pitanga, a tropical version of the cherry, as well as lemongrass, which Santos brews into a calming tea. Tall plants and vines guard against street noise, the fierce summer sun, and the prying eyes of neighbors. “The garden forms a barrier to heat and pollution,” Skaff says, “and, along with the large windows and cross ventilation, [helps] this apartment stay fresh throughout the year.” Santos says she hates air-conditioning. Remarkably, she almost never needs it.